I meant to post this earlier today but work and travel have thwarted my efforts! 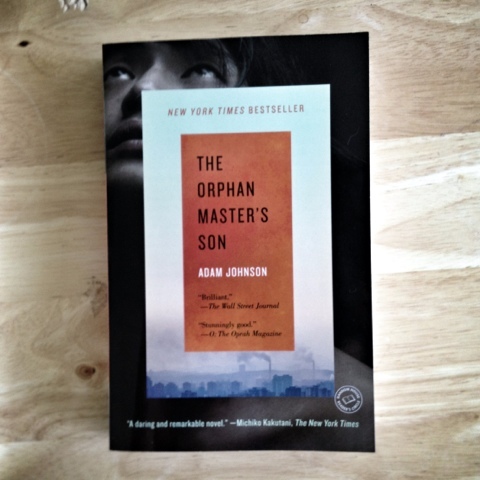 THE ORPHAN MASTER'S SON by Adam Johnson tells the sweeping tale of Jun Do, an unlikely orphan turned unlikelier heroic figure in North Korea. Jun Do believes his father is the cold, cruel orphan master, hardened from losing his beautiful mother, a singer whisked away to the capital before Jun Do can remember. He endures the pains of the orphanage only to be trained in fighting in pitch darkness, (after suffering through extensive pain endurance training) so that might lead his team in exploration of the tunnels under the DMZ. Fighting through the darkness and enduring pain are exactly the skills one would need to survive life, if you can call it life, in Johnson's rendering of North Korea (i.e. the Democratic People's Republic of Korea). The key to fighting in the dark was no different: you had to perceive your opponent, sense him, and never use your imagination. The darkness inside your head is something your imagination fills with stories that have nothing to do with the real darkness around you. "Where we are from," he said, "stories are factual. If a farmer is declared a music virtuoso by the state, everyone had better start calling him maestro. And secretly, he'd be wise to start practicing the piano. For us, the story is more important than the person. If a man and his story are in conflict, it is the man who must change...But in America, people's stories change all the time. In America, it is the man who matters. Perhaps they will believe your story and perhaps not, but you, Jun Do, they will believe you." Jun Do is mistaken for an important North Korean figure, which later he uses to his advantage. Just as stories matter more than people, Jun Do falls in love with the story of the actress tattooed on his chest, and becomes a much better version of the man he was mistaken to be. THE ORPHAN MASTER'S SON is a highly engrossing read, though the horrors of life in that mysterious country are hard to stomach. The patriotic messages on the loudspeakers are humorous in their complete juxtaposition of reality, spouting lies to keep their citizens obedient. ("Jun Do understood that in communism, you'd threaten a dog into compliance, while in capitalism, obedience is obtained through bribes.") Johnson's North Korea is vividly imagined, making one wonder how he came to construct such a convincingly awful reality. The story culminates in a satisfying, bittersweetly triumphant conclusion, and is well worth reading sooner rather than later. *I read this book courtesy of TLC Book Tours, Random House, and my local public library.